It is with confidence and pleasure that we introduce “Ziggy’s Kettle Corn” to you. Ziggy’s Snack Foods, LLC, a 2 year old company has made tremendous inroads into a very competitive chip market. They were and are able to because they feel that their highest standards have been met and their products are produced in an allergen free facility as well as labeled as gluten free. The corn is an all natural whole grain product made with Himalayan Pink salt with as much as 84 natural minerals. They had an immediate impact in the marketplace and Ziggy’s has become a popular trademark nationwide. No entrepreneur would enter this arena if they felt that they wouldn’t make a difference; Ziggy’s has. 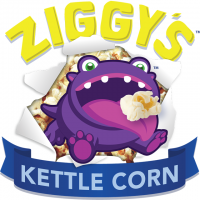 In the upcoming months and years, they expect to build the Ziggy’s brand into an all purpose snack line with many flavors of popcorn and other popular and original snacks.